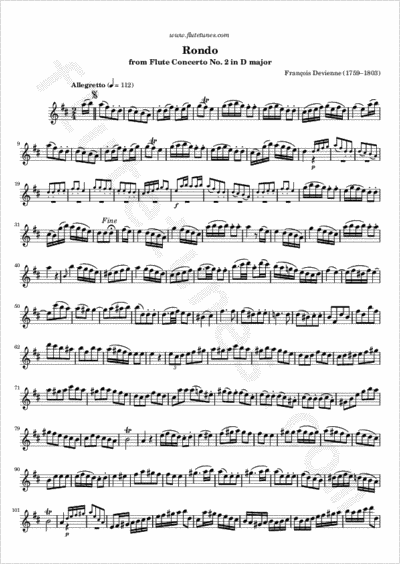 Upon a request by Amanda, one of our kind followers, today we present a full transcription of the third movement of Devienne's Flute Concerto No. 2. It is a Rondo, to be played in the form ABABCA. We inserted some measures from the oboe and the violin parts, so that the whole piece can now be played on just one instrument. In order to distinguish them, these insertions have been engraved in small notes. And now for some words on the Composer. François Devienne was an 18th-century French composer and professor of flute at the Paris Conservatory. His compositions for flute, revived by Jean-Pierre Rampal in the 1960s, are now better known to flutists, but still not, unfortunately, to the public at large. Devienne’s concertos are actually quite remarkable, and Concerto No. 2 in particular is an admirable example of grace and balance, reflecting the elegance and brilliance of classical music in Paris at the time. All these qualities earned Devienne the title “the French Mozart”.